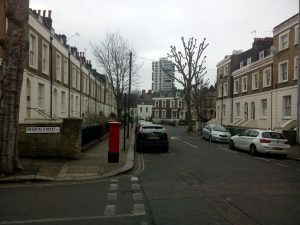 At our not-so-new venue at 41 Grosvenor Park SE5 0NH (see picture below). It’s much more respectable than it looks. 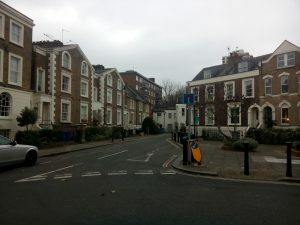 Coming from Burgess Park, cross Camberwell New Road and proceed in an westerly direction along Urlwin Street, under the railway bridges, left at the end and straight on into the cul-de-sac in front of you. Very respectable. Look carefully, no 41 is slightly less respectable and belongs to the tenants association. That’s the place. No bike parking. Try the railings. We still haven’t found a pub. Bring pub radar. If you get lost phone 07842 640 207 and I will walk out and wave my arms around.